On the heels of its outstanding opening in Latin America, Alcon Entertainment’s drama “The 33” has been selected to screen for movie fans at film festivals from Korea to Brazil and across the United States. Audiences everywhere have been taken with the film, which tells the never-before-seen actual events that unfolded above and below ground surrounding the terrifying mine collapse and the desperate international efforts to reach the trapped men. 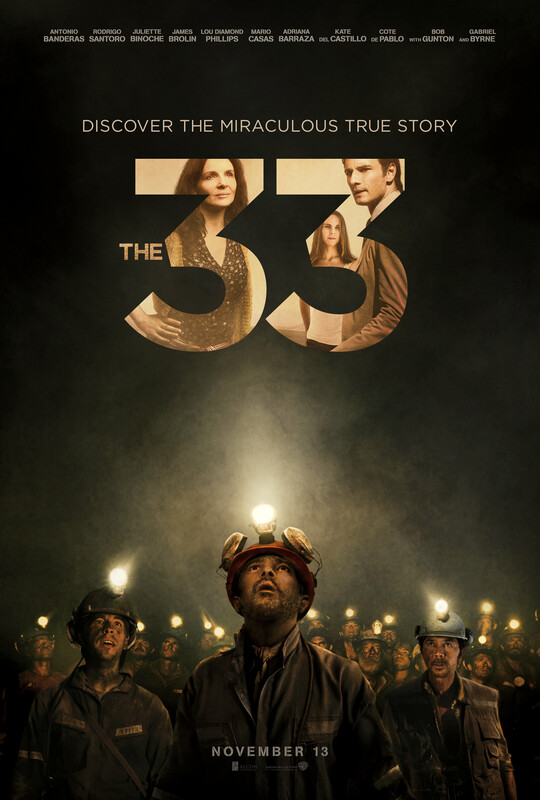 “The 33” opens nationwide on November 13, 2015, exactly one month after the five-year anniversary of the rescue. The festival screenings kicked off halfway around the world in Korea, where “The 33” was presented at the Busan International Film Festival on October 5th. The film was then shown at the Rio De Janeiro Film Festival in Brazil on October 10th. Internationally, “The 33” will also screen at Poland’s Camerimage International Film Festival in November. The Kansas International Film Festival in Kansas City on November 8th. The Napa Valley Film Festival on November 10th. The film’s award-winning director, Patricia Riggen, will be in attendance at many of the U.S. events to present “The 33” to the festival attendees. In addition, on October 27th, the Chilean Ambassador to the United States will attend a special VIP screening of the film at the Newseum in Washington D.C., hosted by Alcon and Warner Bros. with key cast and filmmakers in attendance. Capping the events, on November 9th, “The 33” will have its Hollywood premiere at the American Film Institute. The premiere will be attended by the cast and filmmakers, including Antonio Banderas, Rodrigo Santoro, Juliette Binoche, James Brolin, Lou Diamond Phillips and Patricia Riggen, along with industry guests. The festival screenings of “The 33” surround the five-year anniversary of the rescue of the miners, on October 13th, which was commemorated with special screenings with Chilean Consulates in New York, San Francisco, Houston, Toronto and Chicago, as well as the Chilean Embassy in Ottawa, Canada. “The 33” features an international cast led by Antonio Banderas, Rodrigo Santoro, Academy Award winner Juliette Binoche (“The English Patient”), James Brolin, and Lou Diamond Phillips, with Bob Gunton and Gabriel Byrne. The cast also includes Mario Casas, Jacob Vargas, Juan Pablo Raba, Oscar Nuñez, Tenoch Huerta, Marco Treviño, Adriana Barraza, Kate Del Castillo, Cote de Pablo, Elizabeth De Razzo and Naomi Scott. Patricia Riggen directed “The 33” from a screenplay by Mikko Alanne, Oscar nominee Craig Borten (“Dallas Buyers Club”) and Michael Thomas, based on the screen story by Oscar nominee José Rivera (“The Motorcycle Diaries”) and the book Deep Down Dark by Hector Tobar. The film was produced by Oscar nominee Mike Medavoy (“Black Swan”), Robert Katz and Edward McGurn. Carlos Eugenio Lavin, Leopoldo Enriquez, Alan Zhang and José Luis Escolar served as executive producers.